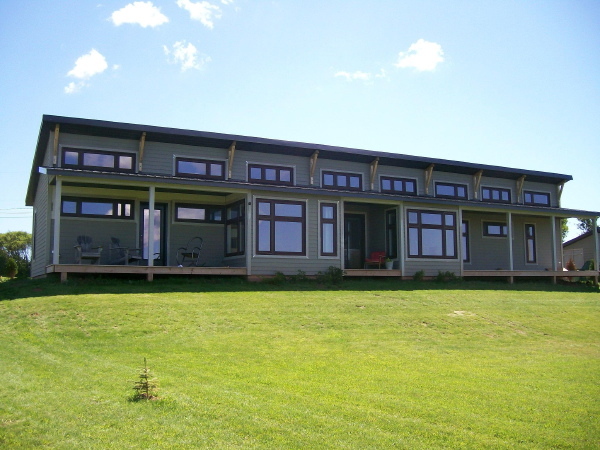 Modern House Plans by Gregory La Vardera Architect: Prince Edward Island Plat House - complete! I would love to see more pictures of this house, it is gorgeous! Thanks David - credit goes out to Ross for the mods, and the owners for the finish choices. I have some more pictures, but too much to post in a blog entry. However I'm getting geared up to post a Flickr group for LaMiDesign houses where I'd post up everything I have on it. I'll post an announcement when it is up, so watch the blog for it. Man, that is a nice lookin' home. That house just looks great everywhere it gets built, every way it gets trimmed out. Fantastic. It's already a classic. A LamiDesign Flickr albumn is a great idea. I remember Ross from the SU forums!!! that's so cool! nice looking house, as always, Greg. that's right Matt! Ross has been covering Canada for me! Greg - Great to see these pics posted and great to be involved in this project with you. The plan is quite similar to the original Platt for the master bedroom, bath, living room, and kitchen. 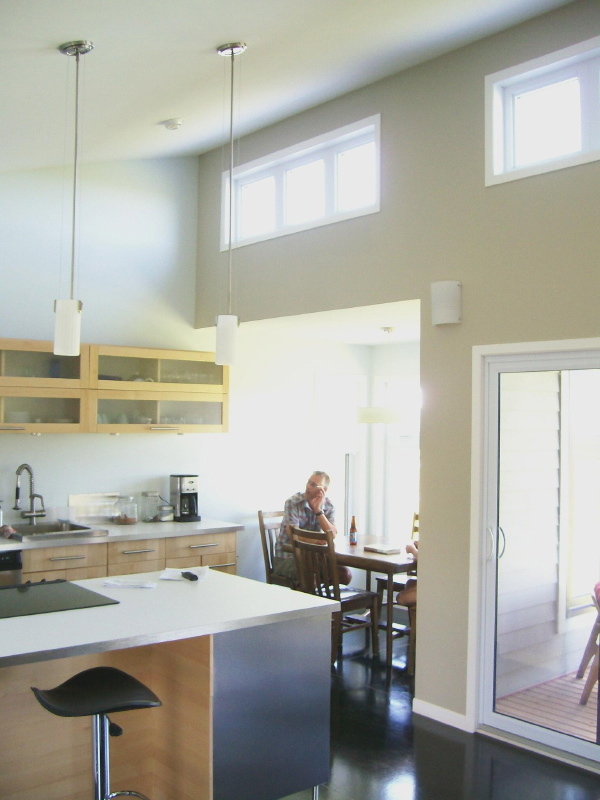 We did flip the kitchen/Living areas to better suit the views and relationship to the side entry that was used. In this version a very successful mod was to visually extend the "hallway" from one end of the house to the other. There are narrow windows (proportioned like doors) at each end. At the master bedroom end it actually isn't a hallway as after the bathroom the space is part of the bedroom. From a central location it does look like a long hallway. When you come into the home from the bumped-out side entry area, you are facing the deck-access doorway between the living/dining spaces and on either side of you is that 'hallway'. It allows you to experience the full length of the 1600 sf house. The effect surprises visitors who almost always comment how the house "feels big". In the bump out, additional to the entry hall is a small washroom with a shower, and a small utility room. Where the hallway continues past the kitchen there are two small bedrooms separated by a small TV watching room. In this bedroom area, the side of the hallway is a long built-in desk counter where the children do homework and play on the computer - making the space do more than just provide circulation. The windows are a combination of vinyl casements and fixed units. All the high-level windows are fixed units. 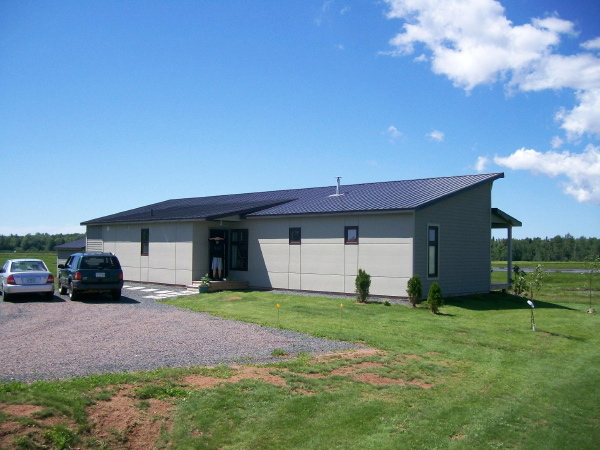 The prefinished metal roofing is what we call 'barn roofing'. It was also used for the soffits on the covered porches. The roofer installed prefinished metal fascias to match the roofing. Siding is hardiplank with hardipanels used on the entry side of the house. Those panels were installed with reveals. The pattern of reveals was coordinated to work with the window openings. The panel look effectively gives the entry side (street-facing) a more formal look. The overhangs are 'thicker' than the original Platt design because the structure was adapted to respond to the severe weather conditions we can get on our island. (We had 80km/hr gusts a few days ago). In conclusion I'd say it was a very successful project. The house is very much a home well-suited to the family and island living. Ross...can you post a floorplan?...I would love to see your mods. Ahh, I wish I could give you a clue as to where abouts it is but I don't know. I was to PEI years ago, pre bridge. If you look up Ross Macintosh I'm sure he could take you to the place.